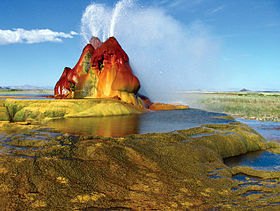 Fly Geyser in Nevada on the edge of Black Rock Desert, was an accidental creation in the search for geothermal energy. During a well drilling in 1964, water with dissolved minerals started rising out of the hole. After the excavation, either the boring was left unplugged or was not capped correctly. Over time a travertine mound was created, with the mineral laden water. The rocks would become covered in multiple hues of green and red. It is our 25th stop in the United States based travel series Off The Beaten Path. 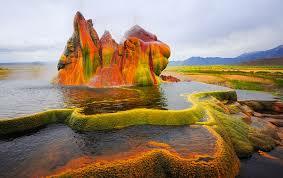 Fly Geyser also known as Fly Ranch Geyser is located near the edge of Fly Reservoir in the Hualapai Geothermal Flats. It is near 5 feet or 1.5 meters high by 12 feet or 3.7 meters wide, if one counts the mound on which it sits. It is still growing, at a rate of several inches a year. The geyser itself has a constant flow of mineral water, throughout the year. The geyser is covered with thermophilic algae, which thrives in moist and hot environments. This simple plant life, is what gives the formation its vibrant shades of color. When the geothermal energy company hit water at the site in 1964, the water was 200 degrees, which although was hot, did not meet their specific needs. The drilling activity did change things on the property. There was a second geyser, that was the result of a 1917 attempt, to find water for irrigation purposes. Being only a short distance from Fly Geyser, it was also at 200 degrees with minerals, not at all suitable for farming. It was then abandoned and over time, a 10 to 12 foot cone of calcium carbonate was formed. Once the pressure was released at Fly Geyser, the original geyser ceased hydraulic activity. It now lies dry, just a few hundred feet south, from the new geyser. 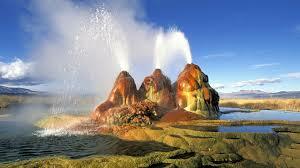 Due to the multiple spouts that comprise Fly Geyser, it has not created one single cone, like the original geyser. Instead, it has created an almost other worldly appearance, with water emerging from various places. The water comes out in a spray form, at the height of some five feet, building up the surrounding area. The geyser releases mineral enriched water into some 30 to 40 terraced pools that are situated across 74 acres. Some of them are hot and others consist of cold water. There are two additional geysers in the general area, that were created in a similar way, which continue to grow. One geyser is about 3 feet (0.91 meters) and is shaped like a miniature volcano. The other one is cone shaped and has risen about 5 feet. The source of the heat for Fly Geyser, is attributed to a deep pool of molten rock, where rifting and tectonic faulting is an ongoing process. The 3,800 – acre property of Fly Ranch was purchased by the non-profit Burning Man Project, in June 2016. It was bought for $6.5 million USD (United States Dollar). The property has opened for guided toursthis year. 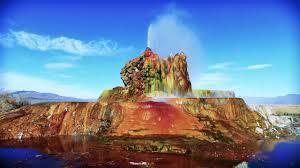 It is the first time, the Fly Geyser has been opened to the public, in decades. It provides controlled access to the geyser and the surrounding pools. It is easily visible from the road (only 1/3 a mile) and the plumes of water can be seen from miles away. Fly Ranch Geyser is located about 20 miles (32.1 kilometers) north of Gerlach, Nevada. It can be seen along the Burner Byway via State Route 34. It is about a two hour drive (107 miles) north from Reno. Tickets for the tours are processed on a donation basis. A deposit will be charged to your credit card with a minimum of $40.00 USD, to reserve your space on the limited capacity tours. After the completion of your visit, you can donate all or a portion of the deposit. You may also request, a full refund. If you have a reservation but fail to arrive, your entire deposit becomes a donation and will not be refunded. Fly Ranch offers tours of the property including the Fly Geyser. These are organized by a local conservation group, known as Friends of Black Rock-High Rock. Tours are offered in the morning from 9:00 am to 12:00 pm during the week. On weekends, tours are offered from 9:00 to 12:00 and then again in the afternoon, from 1:00 pm to 4:00 pm. Groups will meet at the time indicted on your ticket, at the Friends of Black Rock-High Rock Visitor Center Store at 320 Main Street. You will then carpool to the ranch. It is advised to arrive 15 minutes early, to check in for your visit. These Nature Walks encompass about 3 hours on a 1.5 mile (2.4 kilometers) excursion. They are totally device free. A visitor will become part of an immersive, participatory, land connected experience. It will not be a photo opportunity for Fly Geyser alone. Photography will be permitted, at the end of the tour. Reservations are required. There is no trespassing allowed. Is available at a motel in Gerlach, or one can spend the night in Reno. If one is more adventurous, they can camp out on neighboring public land in the area. Remember the sun can be intense during the day. Apply sunscreen for the 3 hour tour. Use sunglasses, to protect your eyes in the bright sun. Wear suitable footwear (closed-toes shoes), for walking and hiking outdoors. Stay hydrated, bring bottled water during the tour. Wow! This place looks so surreal, Jeffrey. I’ve learned so much about this geyser that the travel bug is itching me. It goes right to my bucket list! A geyser in the desert? Sounds interesting as I would expect those rather in Iceland. Thx for sharing this informatio.